City of Nice is one of the most famous cities of the “Côte d'Azur” in France. It is the fifth most populous city in France. Warm Mediterranean Sea and a good climate made Nice a popular resort already in the 19th century. Nice is the second most visited by tourist city in France. It is also the second largest by number of accommodations city. Nice annually is visiting by more than 4 million tourists. Holidays on “Côte d’Azur” are not only pleasant, but also prestigious. In Nice and other cities of the French Riviera real estate want to have people of many countries, but can afford it only most wealthy peoples. Parallel to the beach is the most famous street in the city, the promenade “Promenade des Anglais”. 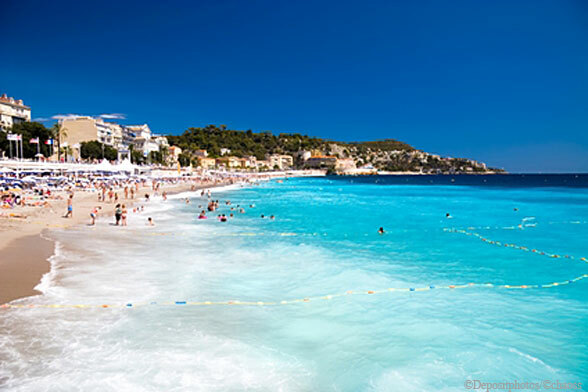 The photo shows the beach in Nice and the Mediterranean Sea. Get more information about Nice.